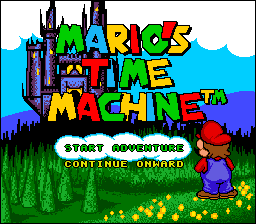 Mario's Time Machine is another one of the many edutainment titles that were released in the 90's. At the start-up screen, press B, Y, B, Y, B, A, B, Y on Controller 1. The player has to input the code before the screen transitions. If done correctly, a menu will appear that comes with a sound test and a museum select. 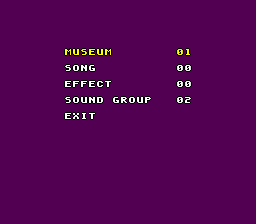 Can be heard in the Debug Menu as Sound Group 02, Song 00. It is, in fact, a remix of the jingle that plays in the opening cutscene ("Welcome to Dinosaur Land..."), and the cutscenes that appear after defeating a Koopaling in Super Mario World. May have been intended to be played on the Software Toolworks splash screen, since that's where the same jingle is used in the DOS version of the game.. This happy theme can be heard on Sound Group 02, Song 04. One of the background instruments appears to be playing the 25m theme from Donkey Kong. This page was last modified on 1 September 2017, at 06:28.